Lionfish is not a traditional or likely seafood selection, but growing interest in response to its invasive and increasing abundance has stirred recreational and commercial interest. Seafood specialist Steve Otwell offers this perspective. Eating lionfish, Pterois miles or Pterois volitans, is being encouraged as one of the best options to mitigate the harmful impact of this prolific, invasive fish threatening reefs and coastal fisheries in ocean waters throughout the Caribbean Sea and neighboring regions in the Gulf of Mexico and southeastern United States. The success of these efforts, in terms of reduction, is debated, but at this time harvest remains a better-than-nothing control. A number of organizations and government agencies have encouraged recreational and commercial harvest of lionfish, emphasizing its favorable culinary attributes. All prudent advice has included statements of caution regarding product handling and preparation, to avoid the notorious, venomous stings that can be inflicted by the unique array of body fins and spines. Although attractive and distinguishing for the lionfish, the fins and spines can inflict a severe sting resulting in localized pain, redness and swelling. More advanced cases can involve neurological problems such as headaches, nausea, numbness, dizziness, and possible convulsions and paralysis. Fortunately, proper handling procedures, including use of gloves and scissors, can remove the potential harm. It is always reasonable to question the quality and safety of all new food selections. In the case of lionfish, additional safety concerns can involve certain natural toxins that could be encountered when you eat it. As with other predatory fish species found in or near certain tropical and reef-associated marine waters, the lionfish may contain ciguatoxins. This risk was recently confirmed by the U.S. Food and Drug Administration, or FDA, following studies in the Virgin Islands, where the waters are known to support the production of potentially ciguatoxic fish. The ciguatoxins are not caused by contamination, and they differ from the toxins associated with the lionfish fins and spines. The ciguatoxins are acquired from the food eaten by the lionfish. Ciguatoxins are produced in certain waters that favor the growth of a particular kind of plankton, the dinoflagellates known as Gambierdiscus. These plankton introduce the potential toxins that can be transmitted through the local food chain, eventually accumulating in some top-order predator fish. The toxins can be concentrated to potentially harmful levels that will persist in the edible portions of the fish and cannot be reduced or eliminated by cooking. Potential toxic levels in certain predators from Atlantic waters can be as low as 0.10 ppb (parts per billion). Indeed the toxins are very potent and the resulting illness is known as ciguatoxic fish poisoning, or CFP. CFP is distinguished primarily by symptoms that can begin to occur within 6 hours after consumption. This rapid onset is a primary reason for the close association people have after eating a meal involving a particular predatory fish. Initial symptoms are gastrointestinal in nature – nausea, cramping, vomiting followed by neurological discomforts – headache, flushing, muscular aching, pain in joints, and weakness, tingling and numb sensation of the lips, tongue and mouth that can be accompanied with dizziness and imbalance. More severe cases have reported sensitivity to reoccurrence and prolonged discomfort for months and years. Confirming a particular ciguatoxic fish poisoning case can be difficult. Many of the symptoms for CFP can be associated with other foodborne illnesses. The identity of the fish involved can be confused by differences in names and unreliable information regarding where the fish was harvested. Analytical tests to confirm the presence and level of ciguatoxins are specialized and complicated, and not routinely available. They also require a sample of the actual meal involved. So far, attempts to develop more convenient and rapid analytical test kits that are reliable have not been successful enough to warrant recommended use in confirming toxins present in fish, harvest areas or meals. Confirmations are further complicated by variation between fish. Meals from two separate fish of the same type from the same source may not present the same CFP risk. Likewise, the occurrence of potential ciguatoxic fish poisoning is difficult to predict. Current advice from food safety professionals is to avoid certain fish species, larger sized fish or fish from certain harvest areas. In 2013, lionfish were added to the list of species that could cause CFP. This existing list is maintained in regulatory guidance for seafood safety issued by the FDA. Lionfish join the list for species of concern, such as jacks, snappers, groupers and other related reef species relative to certain harvest areas. As top-order predators, barracuda are well-known candidates for ciguatoxins. The FDA and certain Caribbean authorities have actually cautioned against consuming it. Florida Sea Grant stock photo. The list already contains some more well-known CFP candidates like amberjacks and barracuda. 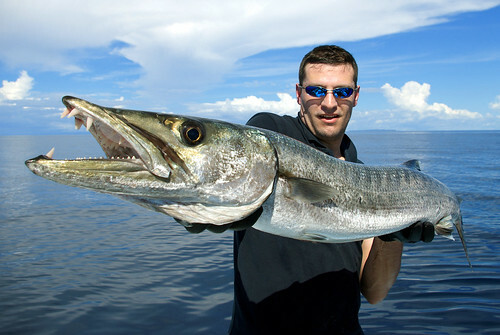 The FDA and certain Caribbean authorities have actually cautioned against consumption of the larger predators, like barracuda. Avoidance of larger fish in certain areas can be helpful, but not always reliable for all species. This recommendation lacks a definition for large fish, and questions how restaurant goers can distinguish a particular fish’s size from the serving portion size. Young fish of larger species can also accumulate toxins, depending on their exposure to particular food chains. The barracuda, for example, is a well-known, top-order predator that can feed in a variety of regional food chains, perhaps accumulating ciguatoxins when they are smaller. Mindful of the voracious and diverse appetite that supports their rapid growth rate, the lionfish could be distinguished as a top-order predator in certain harvest areas. Overall, the primary way to avoid CFP is to avoid fish harvested from known or suspect ciguatoxic areas. Unfortunately, knowing about suspect areas depends on knowing how many illnesses have occurred in those areas, rather than confirmation through routine testing. Advice from pertinent regulatory authorities and health-based programs has cautioned against harvests in certain areas, but there are no actual prohibitions restricting harvest of lionfish or other potential ciguatoxic fish from any waters. Obviously, because we have little history of eating lionfish, and no reported CFP cases associated with eating lionfish, there is no evidence to guide our harvest of lionfish. Some evidence for CFP associated with other fish species has resulted in historical attempts to prohibit markets and restaurant from selling certain potential ciguatoxic fish, such as barracuda in Puerto Rico or Dade County, Florida, but there are no prevalent or enforced restrictions at this time. What may appear to be hesitation by authorities and confused debates among public advisories are due to the lack of distinct and confident confirmations for CFP occurrence in certain harvest areas. Potential CFP risk per area is unpredictable and lacking analytical verifications that are consistent through time. Likewise, the potential risk for ciguatoxins in the food chain is also difficult to confirm, because it is subject to changes in the distribution of fish species and their feeding regimes, which are in turn influenced by seasons and shifting thermal conditions. ‘Official’ designations for risk areas or prohibited harvest and market restrictions of a particular species are difficult to enforce and can have unintended consequences for other fishing, tourism and related commerce in the region. Unofficial designations, available through a variety of publications and public advisories, have ranged in geographic extent from small, individual islands to coastal and reef perimeters involving the entire Caribbean, Gulf of Mexico and South Atlantic waters. These designations are often compiled without documented confirmations. In general, many experts identify ciguatoxic regions as the tropical and subtropical waters of the world between 35° N and 35° S latitudes. This designation encompasses areas with a preponderance of reef environments. To further confound the situation, legal interests focused on concerns for food safety can view the questionable risk and conflicting advice regarding lionfish as potential liability across all sectors of commerce. At present, the commercial harvest, processing and distribution of seafood in retail establishment and restaurants is subject to a multitude of food safety regulations. One system of mandated food safety control is known as HACCP, which is a preventative approach to food safety practiced industry-wide. All seafood processed for commerce in the United States, regardless of the means or location of harvest, must comply with mandatory HACCP guidelines. Seafood is also subject to food codes and state-based health requirements that include general guidelines to reduce or eliminate potential exposure to any toxins in any food. The ciguatera issue is specifically addressed for a variety of specified fish in the FDA’s Fish and Fishery Products Hazards and Controls Guidance, which represents FDA’s current thinking on appropriate risk prevention. In addition to a list of species of concern, the FDA has specifically mentioned concerns for harvest of potential ciguatoxic fish from the Flower Gardens area, one of the most northern regions for reefs found in the Gulf of Mexico. The FDA has likewise included advice against consumption of barracuda. FDA advice is based on actual product analysis or occurrence of illnesses associated with particular fish species. The agency’s advice is not a legal prohibition, but it carries the same essential message because of the legal consequences that could result when a complaint occurs for any associated illnesses. In addition, in 2013, the FDA proposed amendments to its Hazards Guide specifically citing lionfish as a potential ciguatoxic species relative to the area where it is harvested. This recommendation was deemed necessary based only on product analysis in suspect waters about the Virgin Islands. The FDA amendment added wording that suggested ciguatera was “emerging” in areas not previously noted and occurrence could be influenced but thermal trends. Again, potential lawsuits arising from foodborne illnesses could reference this advice and heighten liability, regardless of whether there were existing prohibitions for harvest or consumption. The majority of lionfish based on their current distribution in waters about the United States should be safe for consumption, but the voracious eating habits and diversity of prey suggests lionfish is a candidate species more prone to accumulation of ciguatoxins if present in areas that harbor the potentially hazardous food chain. Based on occurrence with other CFP-related species, the more problematic harvest areas have involved warmer tropical waters and imported sources. 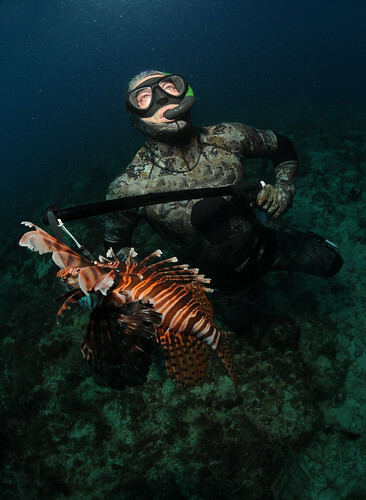 Cooking lionfish does not kill ciguatoxins; the best way for recreational fishermen to avoid CFP is to avoid areas known to have a CFP history. Florida Sea Grant stock photo. Recreational harvesters should be aware and informed about potential ciguatoxic areas and concerns. This will be complicated by lack of designated areas, as previously discussed, and limited use of analytical verifications to distinguish risk areas for recreational harvest. Mindful of this situation, some recreational harvest events have resorted to participant signatures on statements to insulate the event promoters from possible liabilities. 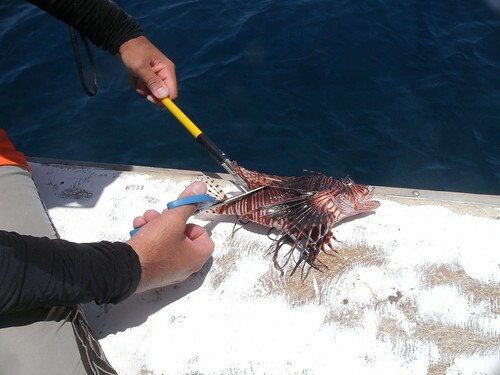 Attempts to use rapid ciguatera test kits for detection of toxins in the edible portions of lionfish meat is not advisable due to complications with the application and errors that can occur in interpretation. The best advice is to rely on prior experience with other CFP-related species in that area. Traditional commercial and recreational harvests of fish that are more permanent residents in waters about Florida and the South Atlantic region have not been typically implicated in ciguatera. In contrast, some of the waters and reefs within more tropical areas like the southern Caribbean have reputations for certain ciguatoxic fish and areas. This reputation is stronger for some of the larger and more migratory predators, like barracuda that feed at the top of the food chains. The sources of advice encouraging lionfish harvest and consumption should be scrutinized relative to the area of harvest. Well-intended articles, such as the cookbook by the Reef Environmental Education Foundation that specifically introduces the lionfish as “The Caribbean’s New Delicacy” could be questionable advice without evidence for the harvest area. Illegal use of fish sold from a recreational catch could also impose risk for the buyers and introduce liability for an uninformed restaurant or retail market. The vulnerability is lack of knowledge for harvest waters and sale of potentially hazardous seafood without scrutiny through established regulations for food safety. Commercial harvest remains subject to mandated HACCP controls for product safety. These require written plans and records as evidence for avoidance of any potential ciguatoxic fish. Avoidance involves controls to assure no harvest from known or designated problematic waters. This requirement is difficult to evidence because of a lack of formal designations and reliance on hearsay information, but it is a real and enforceable requirement that has involved many companies being implicated in inspectionasdfs and liability cases. Illegal representation of a commercial harvest, either by improper identification of the source or species is a strict violation of prevailing food safety regulations, and can increase the liability for the processors, wholesaler, or retail operations. Likewise, harvest and importation from areas more suspect for potential ciguatoxic lionfish should be discouraged. Persistent publicity about illegal fish substitution and mislabeling of species or product origin suggest less scrupulous commerce could be tempted to seek and market lionfish without proper identification. Buyers are cautioned to purchase lionfish from reputable suppliers and sources with food safety programs and evidence for harvest area. It would be prudent to document product suppliers and respective sources as done for other commercial species and harvest areas of concern. Download the PDF of this post: Lionfish: Is it Safe to Eat? Assessing the Incidence of Ciguatera Fish Poisoning with Two surveys Conducted in Culebra, Puerto Rico, during 2005 and 2006. Azziz-Baumgartner, E. G. Luber, L. Conklin, T.R. Tosteson, H.R. Granade, R.W. Dickey and L.C. Backer. 2012. Environmental Health Perspectives 120(4)526-529. Ciguatera: A Public Health Perspective. Dickey, R. W. and S. M. Plakas. 2010. Toxicon 56(2010)123-136. The Lionfish Cookbook: The Caribbean’s New Delicacy. Ferguson, T. and L. Akins. 2010. Reef Environmental Education Foundation (www.REEF.org). 126 pages.